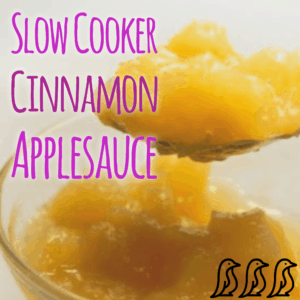 This super easy homemade applesauce is perfect for a naturally sweet snack! Make it as smooth or as chunky as your prefer. Add all ingredients to your slow cooker and cook on high for 2 hours or low for 4 hours. Break up large apple chunks with a potato masher. For a smoother applesauce, blend with an immersion blender or regular blender.